Diesel Loverdose sophisticated, stylish, gourmet, oriental, feminine fragrance. 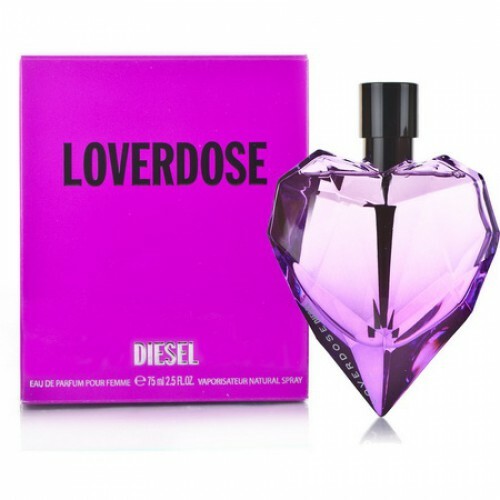 Diesel Loverdose 75ml. Eau De Parfum attracts you by name. Glass was heart shaped, hide oriental vanilla flavor right Peter all seasons. The fragrance opens with fruity tones, mandarin and jasmine flowers. Base notes exudes a woody aroma of vanilla mist envelops you in a sweet-spicy, with a touch of anise. Fragrance name can be interpreted as'' overdose of love - this weapon carefully treated. "Try a scent that will attract all eyes. Diesel Loverdose name of the fragrance consists of two words - Love and Overdose. This floral-oriental composition reveal notes of star anise and mandarin. Heart notes are made up of a composition surprising bouquet of gardenia, jasmine, licorice, combined with base notes of vanilla, amber and woody notes. Design Diesel Loverdose vial is in the form of heart pierced by an arrow cut diamond. Bright Perfume Diesel filled with the spirit of controversy and passion. Seductive fragrance begins tangerine tones and anise. Continues the mix of seduction notes of gardenia, jasmine and licorice. Sweet and soft pyramid completion of vanilla, amber and woody chords soothing hot essence, inherent previous shades. Character: stylish, sophisticated flavors Group: aromatic, oriental Heart: gardenia, jasmine, licorice Train: amber, vanilla, woody notes. Sparkling facets gentle pink hearts hidden in the depths of his stunning aroma of Diesel Loverdose. Fresh floral bouquet with a hint of sweet fruit fills you with anticipation of something unusual and romantic, gives sense of ease and confidence. Delicate fragrance new perfume hides a real spectacle of feelings, alluring flame of passion, poured into the veins, encourages and inspires the romantic exploits.